First, a little turntable history. When stereo was first invented in 1958—when single-channel music systems (“mono”) became 2-channel stereo systems—the most popular turntables were automatic “record changers.” These were turntables that could play several records in a row. Users would stack multiple records onto the tall central spindle and the turntable would automatically drop the next record down to the platter when the previous record was finished playing. Since a typical record contained about 20-25 minutes of music on a side, stacking four or five records was a convenient way to enjoy well over an hour of uninterrupted music. The idler wheel was a small wheel about 1.5” in diameter inside the rim of the platter. It was driven off the main turntable motor and “geared down” to the proper record speed of 16 2/3, 33 1/3, 45 or 78 RPM. Idler wheel was a dependable, simple, gutsy drive system. 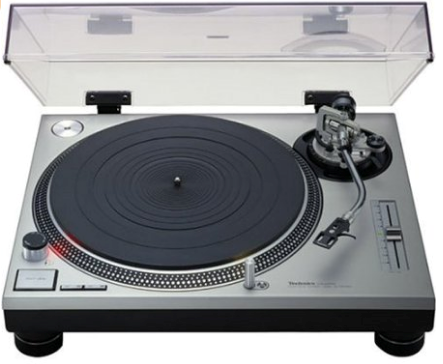 All the popular turntables used them, like the Dual 1009 and 1218, the Miracord 50H Mk II, the Miracord 40A, and most of the Garrards, like the extremely popular RC-88 of 1960. Over time with heavy use, the idler wheel could develop a “flat spot,” imparting a thump-thump-thump sound to the record. Replacing the wheel was inexpensive and fast, however. The main motor’s vibration could be transmitted to the record’s sound, because the idler wheel was mechanically coupled to the main motor. This transmitted motor noise was known as turntable “rumble,” a low-level, low-frequency drone that not only wasted amplifier power by “presenting” extremely low-frequency signals to the amplifier that it tried to reproduce (low-frequency signals require the most electrical current and low frequencies tax an amplifier the most), but turntable rumble could also interfere with the audible sound in the higher registers. Ported speakers were especially prone to the interference and distortion caused by these “subsonic” frequencies, which is why amplifiers and receivers in the turntable era had front panel “rumble” filters that cut the low frequencies, usually below around 60Hz. It cost you some bass, but it cleaned up the sound. Sealed speakers (“acoustic suspension”) were pretty much immune to “rumble,” which is just one of many reasons that sealed speakers like AR, KLH and Advent were the market leaders in the 1950’s through the 1970’s. Serious audio/equipment aficionados (“audiophiles”) distained the notion of stacking and dropping records on top of each other, and grinding their fragile grooves against one another. No, serious audio enthusiasts were “one record at a time” users. That being the case, there was no need for the high-torque idler wheel drive system, since single-play turntables didn’t need the torque to power through the weight of all those records sitting on the platter. 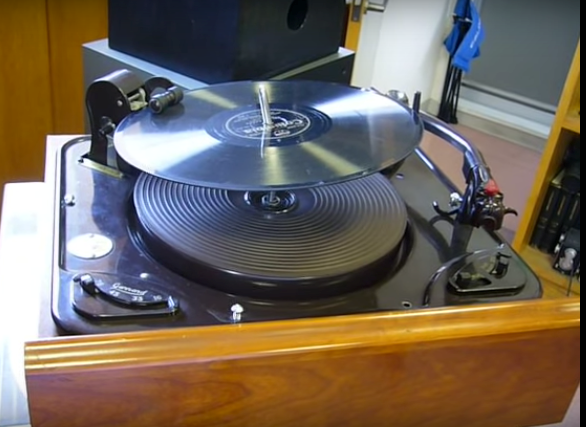 A single-play turntable only needed enough torque to spin one record. There must be a quieter way to do this than with a noisy idler wheel, with its mechanically-coupled rumble. There was a better, quieter way. It was called the belt-drive turntable. In the mid 1960’s AR (Acoustic Research, the people who invented the small high-performance “sealed” speakers that revolutionized the entire stereo industry) came out with a simple, inexpensive. 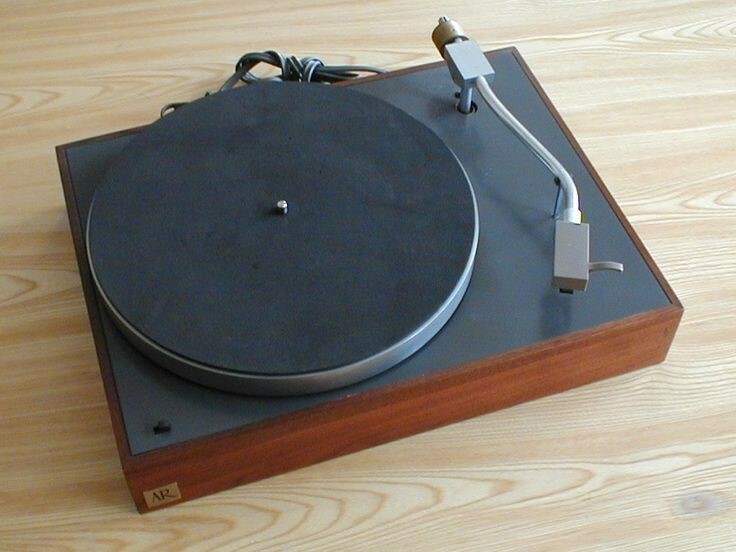 belt-drive single-play turntable. 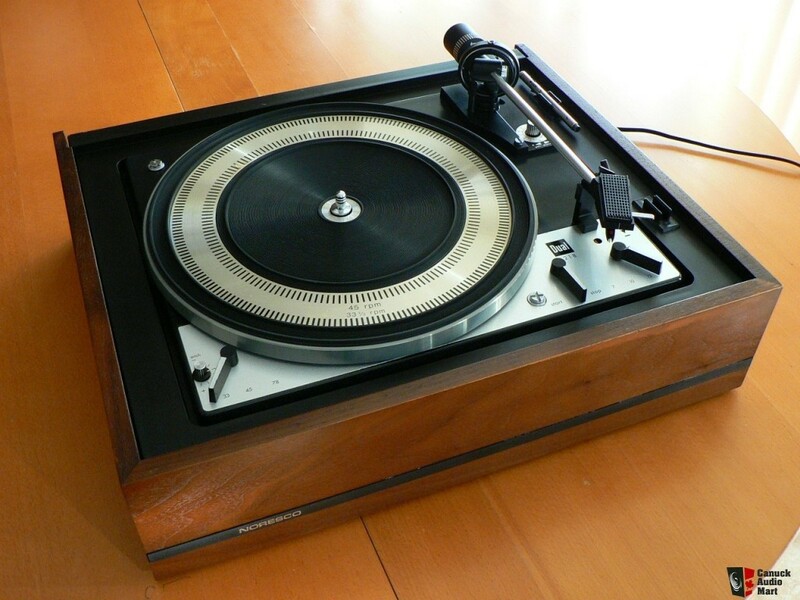 It was simply called “The AR Turntable” and it sold in the millions. Millions. Its basic audio performance in terms of quietness and absence of rumble was far superior to the standard record changers of the day. The AR Turntable (and other belt-drive turntables) used a rubber belt that stretched from the turntable’s motor around a lip on the underside of the platter to spin the platter. The inherent vibration-damping trait of the rubber belt meant that these turntables had much quieter operation than most idler wheel units, because the motor’s natural vibrations would simply be damped and absorbed by the rubber belt before they reached the record. It was (and remains) a system of beautiful and inherent simplicity and efficiency. The belts would stretch over time and slip, resulting in inconsistent platter speed (known as “wow” and “flutter”) and would require replacement. Replacing the belt was fast and inexpensive, however. The overall torque of a belt-drive system was much lower than idler wheel, which is why stacked record changers were always idler wheels—you needed that gutsy torque to spin a heavy platter laden with the weight of 4 or 5 LPs. A belt-drive system just couldn’t do it. But as we said, that didn’t matter to the serious audio enthusiast. They didn’t want to stack records. Then around 1972, Panasonic introduced a new drive system, under its Technics brand name: Direct Drive and the now-classic Technics 1200 turntable. In a direct-drive turntable, the platter sits directly on the drive motor (often speed-controlled by a quartz-control system, like a fine Swiss watch), which spins at exactly 33 1/3 or 45 RPM—far slower (and therefore more quietly, with less vibration) than the motor in either a belt-drive or idler wheel system. And they were torquey too—although by the 70’s, stacking records on top of each other 1960’s-style had fallen out of favor, so there weren’t really any “direct drive” record changers. Direct-drive didn’t require that the user replace an idler wheel or a drive belt. They were essentially maintenance free. (Maybe a drop of lubricating oil once every 6 months or year. That was it.) Their speed accuracy was great. They were quiet—although truth be told, they did still impart a little noise to the rest of the system. A minor downside was that since the platter sat directly on the motor (that’s why they call it “direct drive”) whatever small amount of noise and vibration the motor did produce went right to the platter. Audio enthusiasts still debate the relative merits—plus and minus— of direct drive vs. belt drive. Belt-drive aficionados insist that the insulating properties of the rubber belt imbue it with superior acoustic characteristics compared to a direct drive turntable. Belt-drive supporters also say that the character of the noise that a direct-drive motor transmits to the platter is more objectionable than the noise transmitted by a belt system (having to do with the spectral content and harmonic structure of the noise signal, etc.). Direct-drive proponents argue all day long that any differences in noise are minimal and theoretical, and are totally swamped by direct-drive’s real-life advantages in speed accuracy and reliability. In reality, the overall superiority of one turntable over another has as much—if not more—to do with its tonearm characteristics as its drive system. Straight vs. S-shaped tonearms, tracking angle distortion, tonearm mass (and compatibility with cartridges of differing compliances), pivot friction, dynamic vs. static balance systems—there are lots of things to consider. That tonearm discussion is beyond the purview of this article. It’s also not as relevant as it once was, because most turntables today come with a pre-matched cartridge, whose compliance, tip mass and tracking capabilities have been chosen to compliment the host turntable’s tonearm’s characteristics for optimum compatibility and performance. One advantage of direct-drive is indisputable, however: The rugged, high-torque, low-maintenance qualities of direct-drive turntables made them perfect for DJ’ing and scratching effects. Without direct-drive turntables, DJ’ing would never have happened. You can’t DJ with a belt-drive Thorens TD125 turntable or an idler wheel Dual 1229. 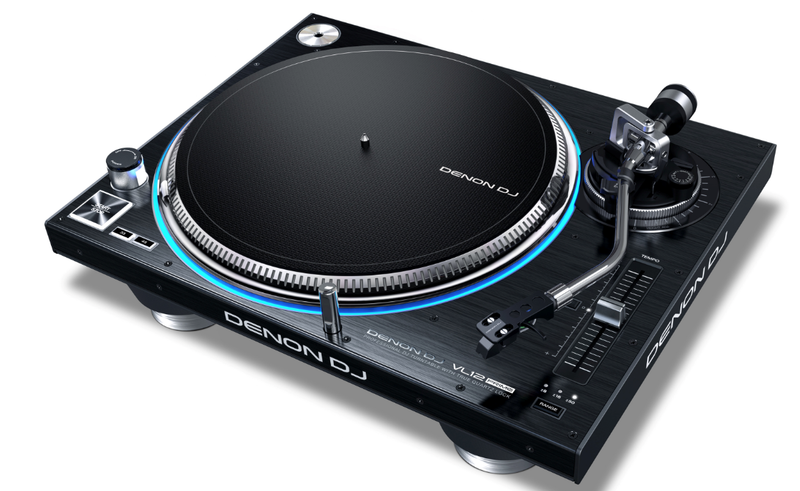 Today’s direct-drive DJ turntables—like the Denon DJ Prime VL12—put a premium on user/DJ interaction in the live performance realm, rather than on ultra-refined music reproduction in a quiet living room like the audiophile turntables from 40 years ago. Where yesterday’s music listener didn’t want the turntable to exhibit any speed variance whatsoever, today’s professional DJ uses their turntable as a live performance instrument. Intentional speed variations, adjustable torque for fast musical start-up and precise “scratching” effects, a rugged cartridge/tonearm system that can stand up to the rigors of heavy-duty use under party conditions, these are all requirements of the professional DJ turntable. Therefore, these days, turntables fall into three broad usage categories: The casual music listener, the “serious” audiophile music listener and the DJ. Turntables intended for each of these user groups are markedly different, with specific emphasis on the performance, convenience, adjustability and durability characteristics that are most important to their intended market. Club DJ turntables are all direct-drive, whereas music turntables are either direct- or belt-drive. The idler wheel is gone, but at least now you have a full understanding of how and why we got to where we are today.